As they say in the trade, Last Tuesday's decline did some real technical damage. Just as it looked like the S&P 500 Index, would soon activate a Double Bottom pattern it reversed and crashed. There is more below in the market review including the worrisome 10-2 Treasury yield spread followed an Enterprise Products Partners LP (EPD) collar and another SPDR S&P 500 ETF (SPY) put spread idea. S&P 500 Index (SPX) 2633.08 got whacked for 127.09 points or -4.60% last week with the largest and more important decline of 90.31 points occurring last Tuesday December 4, once again increasing the probability of retesting the October 29 low at 2603.54. 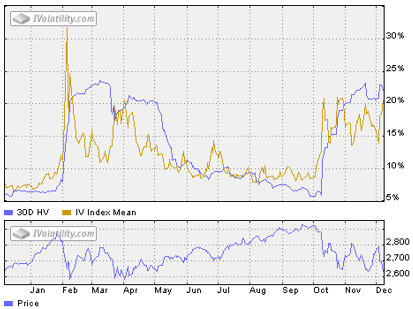 CBOE Volatility Index® (VIX) 23.23 advanced 5.16 points or + 28.56% last week. Our similar IVolatility Implied Volatility Index Mean, IVXM using four at-the-money options for each expiration period along with our proprietary technique that includes the delta and vega of each option, gained 4.52 points or +28.16% last week ending at 20.57. The one year volatility and SPX line charts follow. Now back near the top of the recent range. While any further advance could make a good decison point to sell or hedge it could also indicate an SPX capitulation bottom should it make a key reversal by trading to a new low but closing higher on the day; although unlikley before the end of the year. The chart below shows as our calculation of Larry McMillan’s day-weighted average between the first and second month futures contracts. With 7 trading days until December expiration, the day-weighted premium between December and January allocated 35% to December and 65% to January for a -10.06% premium vs. -1.04% last week ending November 30. Still very much in the caution area, well below the bottom of the green zone between 10% to 20%. For daily updates, follow our end-of- day volume weighted premium version located about half-way down the home page in the Options Data Analysis section on our website. Big Data? In options we are Big Data! Try Our New Probability Calculator for Stock and Option Traders! According to one source Tuesday's initial decline was the result of a large SPX futures sell order triggered by a Commodity Trading Adviser when the SPX crossed below the 200-day Moving Average after closing above the average Monday. It also seems likely the sell program was activate when one portion of the Treasury curve inverted when the 3-year note yield advanced to 2.81and above the 5-year note yield of 2.79, creating a 2 bps inversion and setting off the large "Algo" sell. 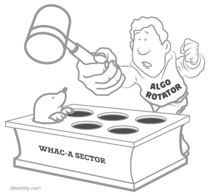 As reminder, here is our old friend the "Algo Rotator" who likely sold (whacked ) SPX futures and bought long Treasury Note futures. While much attention is given to the spread between the 10-year and 2-year yield, the algorithm could have been activated when the SPX declined below the 200 day-Moving Average when any portion of the yield curve was inverted. 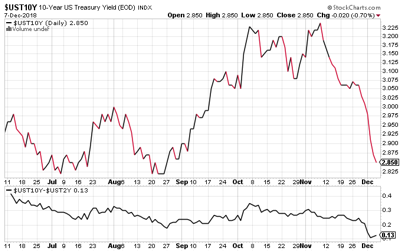 Since the 10-2 yield spread is widely followed, now is good time for an update. With the 10-Year yield at 2.85% and the 2-Year at 2.72 the spread closed at .13, still positive and up slightly from Tuesday when it closed at .11. The decline from 3.24 on November 8 signals expectations for a slowing economy. At the end of the week the 3-year Treasury note yield remained 2 basis points above the 5-year. Based on commentary from Federal Reserve officials about the strength of the US economy, there seems little acknowledgement that US dollars through the London based euro-dollar market provides global liquidity and rising interest rates on LIBOR linked loans has already slowed global growth beyond what the Fed defines as a "neutral rate" based solely on domestic indicators. Market indicators show the risk of a global recession has increased and unless they take their foot off the brake they will likely cause an accident despite the declining 10-Year Treasury yield flashing an unmistakable yellow caution signal. The December FOMC meeting is scheduled for Tuesday December 18 and Wednesday December 19. Hedge further downside. For the same reasons given in Digest Issue 47 "Technical Score [Charts]" the time has come once again to consider hedging against more downside. For long positions, collars (sell calls and buy puts) will provide some downside protection. Here is an idea to consider. Enterprise Products Partners LP (EPD) 26.20 declined .05 or -.19% last week after testing support at 25.50 Thursday. Seasonally this is when it starts advancing going into the spring. Using the ask price for the buy and bid for the sell the collar debit would be .25. Presuming a 100 share long position around the current price the collar debit would be covered by the .4325 dividend in late January or early February. While the collar will provide downside protection the stock would be called away on an advance above 28. The option volume and liquidity is low, but the bid/ask spreads are reasonable. Alternatively, consider SPDR S&P 500 ETF (SPY) put spreads again. Here is an updated hedge trade plan to consider. SPDR S&P 500 ETF (SPY) 263.57 declined 12.08 points or -4.38% last week, now testing the October 29 low at 259.85 for the fourth time. 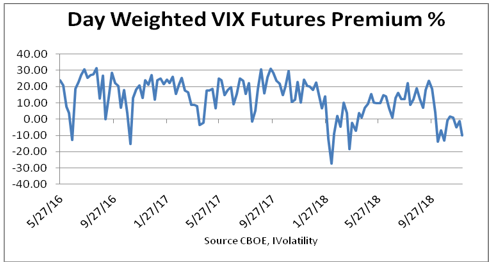 With a current Historical Volatility of 22.09 and 18.41 using the Parkinson's range method, the Implied Volatility Index Mean is 20.64 at .54 of the 52-week range. The implied volatility/historical volatility ratio using the range method is 1.12, so option prices by this measure are reasonable relative to the recent movement of the ETF. Friday 5.2 million contracts traded with the 5-day average of 5.0 million contracts with reasonable bid/ask spreads, and open interest of 25.7 million. Good volume and liquidity here. Using the ask price for the buy and mid for the sell the long put spread debit would be 1.60 about 32% of the distance between the strike prices with 74 % of the long put price risk hedged by the short put. Unlike the trade plan in Digest Issue 47 "Technical Score [Charts]" that was unwound on November 28 when it closed above the SU (stop/unwind) at 270, this time it will be set at 280 – the level that will activate a triple bottom pattern on the presumption that year end selling is nearly completed. While the S&P 500 Index has tested the October 29 low four times confidence that the low will hold remains uncertain before the Federal Reserve FOMC meeting on December 18 and 19 along with ongoing trade and tariff negotiations with China. Accordingly, hedging against additional downside risk seems prudent. We now offer daily trading ideas from our RT Options Scanner before the close in the IVolatility News section of our home page based upon active calls and puts with increasing implied volatility and volume. "The best volatility charts in the business." Next week will again include market and trade idea updates. All previous issues of the Digest can be found by using the small calendar at the top right of the first page of any Digest Issue. Click on any underlined date to see the selected issue. Another source is the Table of Contents link found in the lower right side of the IVolatility Trading Digest section on the home page of our website.